19 September 2018, 16:04 p.m. 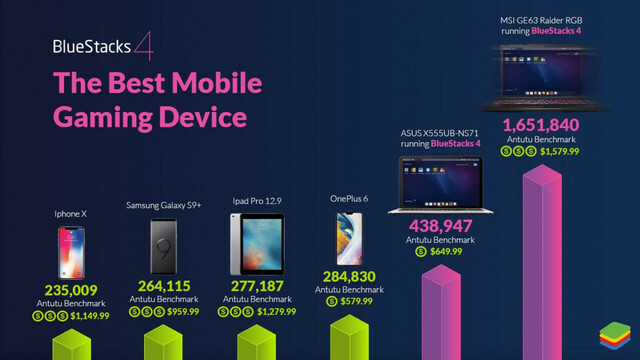 According to BlueStacks, the latest release is six times faster than a Galaxy S9+ with its AnTuTu score of 263,827. The PC, meanwhile, scored 1,651,840. For context, the reference PC was no slouch with an eighth-generation Intel Core i7 processor, 16GB of RAM, and a GeForce GTX 1070 GPU. A mid-range laptop, the Asus X555UB-NS71, still beat even the fastest smartphone on AnTuTu (the Mi Black Shark scoring 289,415) with its sixth-generation Core i7, GeForce 940M, and 8GB of RAM – although not even by double, with a score of 438,947. Nevertheless, it’s highly impressive for emulation. With Microsoft struggling to attract developers to build native UWP apps, it provides PC users with a way to access the latest Android apps with even greater performance than most Chromebooks. Alongside the improved performance, BlueStacks also now allows users to run multiple instances – which includes the ability to play several games from different Google Play Accounts at once. What are your thoughts on BlueStacks’ latest update? Let us know in the comments.